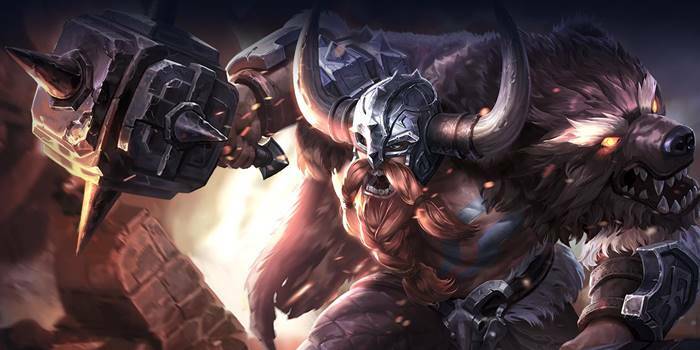 A guide to Arena of Valor's hero Ormarr, the Berserker. Ormarr subdues his foes with heavy swings and abilities that lock them helplessly in place. Ormarr is a melee hero who specializes in stunning and slowing enemies to ensure their demise. He is especially deadly when supporting allies, locking down opponents and leaving them completely vulnerable. Crowd Control for Days – With a (random) passive stun, a knock up, and another ability that can either slow or stun when used, Ormarr is a crowd control machine. Add in some items that disable the enemies’ movement and there will be next to no chance of escaping the berserker once engaged. Good at Ganking – His abundance of disables allows Ormarr to shine when ganking. His kit allows him to get close to high priority targets and lock them in place with his stuns until either he or his team can score the kill. Strong Team Fighter – Given his kit’s focus on area of effect abilities, Ormarr is much more useful in team fights than when alone. His disables stop or slow everyone touched by them, allowing Ormarr to lock the entire enemy team down. Struggles Solo – While a powerful team fighter, Ormarr can’t do much in duels. His damage is unimpressive, so he will struggle at taking down targets when an ally isn’t backing him up. Not as Tanky as Other Off-Tanks – Ormarr is good offensively but isn’t quite as durable as other off-tanks. Players will need to focus on building defensive items to avoid being killed before they can properly contribute to their teams. Susceptible to Control Abilities – Stemming from his lower natural defensive stats, Ormarr is weak against control abilities. Ormarr’s abilities require him to get up close to enemies, so his contribution to fights is mitigated if he is kept at a distance. Ormarr excels when playing as a roaming support and so should start in the Abyssal lane to help the carry in the earliest moments of the match. After hitting level 2 or 3, start to move around the map to assist the jungler with ganks as well as scout out the enemy jungle. Gank any opponents who have pushed beyond the river into your team’s territory. This will ensure that the target cannot simply duck underneath their tower once the fight starts. Start with Swagger. This will be your main damaging and control ability during skirmishes and team fights. Level Unstoppable next, as this will enable you to dash toward your intended target. This ability can be used as an escape mechanism as well as a chasing ability. Finally, Walking Tall should be leveled whenever available. Cast this during team fights in order to hit as many opponents as possible. One on One: Ormarr should generally avoid one on one conflicts whenever possible due to his low damage output. If forced to, hit the enemy with Swagger right away to either stun them or build up towards a stun. Team Fights: Coordinate with your ally so that they know your intention before going in. Rush in with Unstoppable, knocking the target up before following up with Swagger. Pepper the enemy with normal attacks afterward in attempts to trigger Gut Punch, disabling them with abilities whenever they come off cooldown. Use Walking Tall if you need to deal damage faster. Alternatively, use Walking Tall when in a cluster of enemeis to damage and stun everyone in the group. Escaping Battles: When you’re losing a team fight and need to disengage, cast Swagger to slow your pursuers. Next, cast Unstoppable away from the enemies to put distance between yourself and the enemies. Ormarr’s passive is what makes him a strong slugger, especially one on one. Having a chance to stun an opponent with even your auto attacks leaves them open to your other damaging abilities. Gut Punch can trigger on any unit hit by Ormarr’s attacks, each unit having a separate chance of being affected. Unstoppable – Ormarr dashes forward and enhances his next normal attack to deal 150/200/250/300/350/400 (+1.15 AD)ˀ physical damage and knock the target into the air. This is Ormarr’s primary initiating ability. Use this to coincide with your team’s engages to maximize the number of opponents you can knock into the air. During ganks, Unstoppable is a strong initiating ability, especially when you flank your enemy in lane. Aim it properly to allow your teammates to follow up and deal further damage to your disabled opponents. Unstoppable’s knock up effect affects all enemies struck by the basic attack splash. Unstoppable’s basic attack amplification disappears after three seconds if unused. Swagger – Ormarr bashes the ground with his hammer, dealing 215/260/305/350/395/440 (+1.05 AD) physical damage to enemies within range and reducing their movement speed by 50% for 1 second. Each cast that hits 1 or more heroes grants Ormarr a stack of fighting Spirit. After reaching 3 stacks, the next cast will trigger Gut Punch. Swagger is your main damaging ability. During team fights, it is essential to use this as much as possible as it deals good damage, an area of effect slow, and triggers your Gut Punch once you reach four stacks of Fighting Spirit. When ganking a lane, cast Swagger after you’ve hit the opponent with Unstoppable. This will cripple their movement for a short duration, leaving them open to your auto attacks and further damage from your teammates. Swagger grants stacks of fighting spirit no matter what type of unit it hits. Jungle monsters and minions can be targeted to get a few stacks when preparing for a gank. Walking Tall – Ormarr swings his hammer in a circle (he is able to move while doing this), each hit dealing 100/120/140 (+0.5 AD) physical damage to enemies nearby. His health is also restored by 2% of his max HP for each enemy hero hit (up to 6% at any given time). This ability cannot be interrupted but can be affected by movement debuffs. He can also use Unstoppable while spinning. Use this ability whenever you find yourself in the middle of a team fight. This way, you get to hit as many opponents as possible and soften them up for your allies. Conversely, you can use Walking Tall immediately after casting Unstoppable and Swagger on opponents. This maximizes your damage output. Each hit of Walking Tall has a chance of triggering Gut Punch. Take note what items Ormarr is building – if he goes tanky, try to bait him into engaging and whiffing his abilities. If he’s going for a bruiser build, coordinate with your team to disable him outright and focus him down. Ormarr has good sticking power and burst damage thanks to his abilities. Ask help from your Support or Tank to get him off your back. Ormarr does pretty well when running a high-offense Arcana set which includes armor pierce, attack damage, and movement speed. Setting up Onslaught, Assassinate, and Skewer gives him good offense stats. Conversely, you can run a defensive arcana setup for Ormarr. Indomitable, Benevolence, and Mythril makes him tanky during the early to mid-game, while you’re farming for your core items. Ormarr has a hard time dealing with tanks, especially early game. This is due to their sheer hardiness and control abilities which can disrupt Ormarr’s combos. They aren’t that weak to crowd control, so Ormarr should focus instead on squishier foes. Ormarr does fairly well against other warriors. Lock down the warrior with Ormarr’s impressive crowd control and absorb their damage so that your allies can take out their health. Ormarr also does well against assassins, able to resist their damage long enough to retaliate with control effects. Even though Ormarr is squishy for an off-tank, he can still hold his own when he decides to throw down with an opposing assassin early game. However, a fed assassin will be a big problem for Ormarr with their high single target damage abilities. Ormarr generally struggles against mages, especially during the laning phase. Since he is a melee hero, mages can use their range and abilities to harass Ormarr and keep him away from the minions. Many mages also have control abilities that hinder movement or outright stun their targets. These spells are trouble for Ormarr as he could get burst down before getting the chance to use his own abilities. Ormarr does well against marksmen. While most marksmen have some sort of slow or stun, Ormarr can use Unstoppable to get close to them and hammer them in place with his auto attacks and Swagger ability. During team fights, after Ormarr initiates, his goal should be to make a bee-line towards the opposing marksmen and take them out. Supports can disrupt Ormarr with their own crowd control abilities. That said, every ability aimed at Ormarr is one that isn’t aimed at his allies, so grabbing their attention should be a high priority in fights.